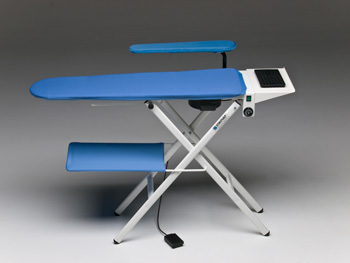 It is a suction, ironing heated board with a temperature controlled by an adjustable thermostat. Manufactured following new European rules with adjustable height on 3 different positions, Model 366 is a solid, wholly folding board provided with a thermic protector on the heating element of the flat against higher temperatures as a guarantee for a total safety. Excellent results of ironings for every kind of cloth are obtained by Mod. 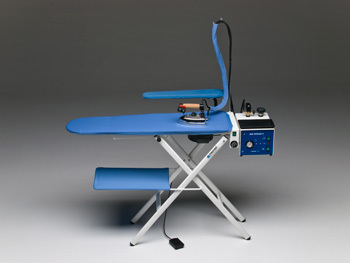 366 as it is manufactured utilising industral technologies applied to domestic use. It is an ironing board that can be coupled up a stainless steel steam generator with 2 liters boiler, 3 liters boiler or 5 liters and complete of iron.